Israeli social welfare policy, as reflected in social spending and service provision, has been very stable over the past decade. Besides continued stability, two developments of the past year illustrate the manner in which policy change happens. One is the new Savings Plan for Every Child program – an outcome of the Committee for the War Against Poverty in Israel (the Elalouf Committee), and of coalition-agreement commitments. The other is an agreement to increase general disability benefits, reached in the wake of a lengthy public and political struggle. Despite these measures, current policy and the present level of social spending, which is considerably lower than that of other welfare states, are not expected to reduce inequality or poverty in Israel substantially over the coming years. 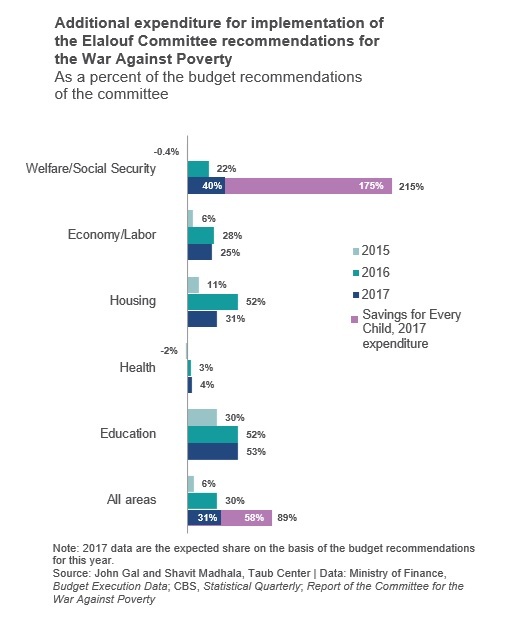 In 2016, social welfare expenditure came to NIS 101 billion, accounting for half of all Israeli social spending (which includes spending on health and education) and about one-third of total government expenditure. Despite the apparent stability in expenditure relative to total government spending and GDP in 2016, there was actually a NIS 7.7 billion increase, in real terms, compared with the previous year – an 8% increase in a single year, compared with an average annual increase of 4% since the beginning of the decade. Social security spending accounts for about 85% of total social welfare spending, and spending in this area rose from NIS 82 billion in 2015 to over NIS 86 billion in 2016 in real terms (in large part due to a rise in expenditure on old age pensions and child allowances by the National Insurance Institute (NII)). According to estimates, the annual cost of this program is expected to be approximately NIS 2 billion per year. However, National Insurance Institute data as of September 2017 indicate that the total expenditure on payments and grants in the framework of this program came to NIS 3.66 billion for the current year, apparently due to retroactive payments from the prior year and a half. Centralization in the framework of bank savings accounts used for the program is apparent: of the 21 financial institutions that manage the plans, the most preferred is the Altschuler Shaham provident fund (24% of all of savings plans), followed by Bank Hapoalim (12%). The second-largest component of NII expenditure is spent on general disability benefits (20%). A September 2017 agreement contains a number of different provisions translating into a disability benefit increase to NIS 4,000 monthly for people whose degree of incapacity is 100%, a substantial increase in labor market earning capabilities before benefits are reduced (“disregard”), and linkage of benefits to the minimum wage. The agreement is supposed to go into effect in January 2018, and the sum allocated to its implementation through early 2021 is NIS 4.2 billion. Recent years have witnessed a continual increase in the Ministry of Labor and Social Welfare’s budget, which in 2016 amounted to NIS 6.43 billion (10% more than the 2015 budget). Most of the Ministry of Labor and Social Welfare’s budget (77%) is transferred to local authorities (see: “Social Service Budgeting in Israeli Local Authorities”). The Ministry of Construction and Housing’s 2016 budget doubled relative to 2015 – from NIS 1.8 billion to NIS 3.9 billion. In 2016, there was a substantial increase in the sales and purchases of apartments for those entitled to public housing, and an additional NIS 150 million beyond the fund’s income was allocated for the purchase of public housing apartments. In 2016, there was an increase in expenditure on income supplements for the elderly, on the Ministry of Economy’s expenditure related to employment and on public housing. The expenditure allocated for the implementation of the committee’s recommendations was about 30% of the total recommended expenditure (NIS 7.4 billion per year), compared to 6% in 2015. It is estimated that in 2017, the actual expenditure will also be about 31% of the recommended annual expenditure. Though implementing a Savings Plan for Every Child did indeed appear in the committee’s recommendations, it was not priced out and was not included in the total recommended expenditure. Including the cost of this program significantly increases the total expenditure for the implementation of the recommendations to about 90% of the recommended expenditure. In other areas – particularly in healthcare and in efforts to increase the income of the working poor – the government’s progress in implementing the committee’s recommendations has been slow. Among the most prominent of the committee’s main recommendations that have not been implemented is the recommendation to increase the benefit level provided by the Income Support Program, which serves as a safety net for Israelis living in poverty.